Breakdown: Margot currently is a top-100 prospect, ranked 21st, and also the Padres’ top overall prospect. 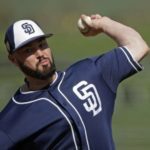 Margot will lose his prospect status fairly soon, as he is in the Padres’ everyday starting lineup. 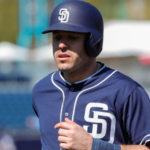 Manuel was acquired by the Padres from the Boston Red Sox in the Craig Kimbrel trade in December 2015. He was an all-star last year in the PCL League for the Champion El-Paso Chihuahuas. Margot is already hitting lead-off for the Padres this season and his potential is being witnessed presently. So far in the 2017 season, Margot has a line of .269/.309/.519 with three home runs, six RBI, nine runs scored, and a stolen base in 52 AB. Two of his home runs came in his first two AB’s in the Padres’ 2017 home opener. Margot has also played superior defense in center field this season. Manuel Margot has played very well this season and is a potential superstar in the making. The only thing Margot lacks is power, which can be overlooked with his ability to hit the ball into the gaps and his well-above-average speed. He projects to hit for a solid average, steal plenty of bases at the top of the Padres’ order, and man a dominant CF for years to come. In 2020, I can see Margot hitting above .300, stealing 40 bases, and being at the top of the MLB leader board in runs scored. Breakdown: Urias was signed by the Padres out of Mexico in 2013. He is currently rated the Padres 7th-best prospect. Last year, Urias played in the Class A Advanced California League, where he was the league’s youngest player. Urias put up stellar numbers for the Lake Elsinore Storm, hitting for a .330 average and getting on base at a .397 clip. The most impressive stats from Urias in 2016, were his walks and strikeouts. Urias actually had fewer strikeouts than walks, with 36 strikeouts to 40 walks. That shows immense plate discipline and phenomenal contact ability. That trait could be incredibly valuable at the top of any MLB lineup. Urias was not only named the Rookie of the Year in the Single-A League, but he was also the Most Valuable Player. It will be very exciting to watch Urias hit at the top of the order for the Padres. Urias is expected to have a very high OBP and batting average, low strikeout rate, he will get you a few steals, and will score some runs for you too. Breakdown: We all know Wil Myers as the face of the San Diego Padres presently. Just this past week, Wil hit for the second-ever cycle in Padres’ history. He is such an enjoyable player to watch, as he has fun on the field and puts his entire effort into the game. He transitioned into a first baseman only a little over a year ago, and can already be considered one of the best defensively in the game at first. This just encompasses what his work ethic is. Myers was the only other player, not named Mike Trout, in the 2016 season to hit at least 26 home runs and steal at least 26 bases. That is impressive. Myers made comments about trying for a 40-40 season this year, although that is a very high goal to reach. I think Myers and the Padres would be overwhelmingly happy to settle with a 30-30 season from Wil. Wil Myers is off to a very hot start to the 2017 season, hitting .365 with three home runs and nine RBI. Myers hasn’t stolen a base yet, but we can expect many to come from him this year. He has recorded a hit in 11 of 13 games this season and currently has a 7-game hitting streak. It is a very promising sight to see from Myers after he signed the largest contract in San Diego Padres’ history during this most recent off-season. The best part about Myers is that he is currently only 26. In 2020, Myers will only be 29 years old and still in his prime. He will be the veteran of the 2020 roster. He will be the heart and soul of this very young Padres team. Wil Myers will be in San Diego for quite some time, and it will be an exciting road to follow. His expectations can be in the 30/30 range. With the kind of power Myers has, unfortunately he falls into the high strike out & low walk rate zone. But hopefully as the years go by, we see this trend improve. 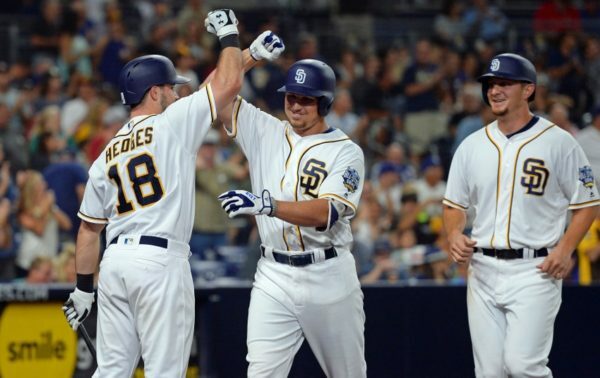 Breakdown: Renfroe is the other MLB top-100 prospect in the Padres’ everyday lineup presently. He is rated as the #39 best prospect in baseball, and the Padres’ third best. Hunter Renfroe is known for his immense power potential and cannon arm from right field. He started his MLB career with a bang at the end of last season, tallying four home runs, including a two-game stretch at home against the Dodgers where he hit a grand slam and a moonshot onto the top level of the Western Metal Supply Building. He also hit for a .371 batting average. Hunter Renfroe has started the 2017 season in similar fashion, hitting three home runs already. Like Margot, Hunter Renfroe was also a PCL all-star last season, and already has plenty of Padres fans cheering him on in San Diego. Renfroe was also named the PCL MVP, hitting .306 with 30 home runs and 106 RBI. Renfroe and Margot have spoken about how great a relationship they have, and how they are each others’ biggest fans. The largest concern over Renfroe is his inability to draw a walk. He has a high swing and miss rate and needs to show more discipline at the plate to walk more and strikeout less. Renfroe has 10 strikeouts and 0 walks in 51 at bats so far in the 2017 season. Aside from that, Renfroe can be expected to hit 30+ home runs,record 100+ RBI, and hit around the .250-.270 range for the Padres. He will be a premier power hitter, batting cleanup, while firing rockets from right field to nail people at the plate for the Padres in the 2020 season. 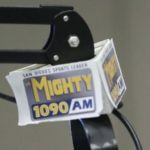 Breakdown: The Padres are loaded with shortstop prospects who are years away from the majors, who all seem to have very high ceilings. This was a tough one, but I chose Tatis Jr. for his high-ceiling and recent performances at the plate. Fernando Tatis Jr. was acquired by the Padres during the 2016 season from the White Sox in the James Shields trade. At the time of the trade, Tatis Jr. was not considered a high organizational prospect, as he wasn’t even in the White Sox top-30 prospects. Since then, Tatis Jr. has received tons of coverage and grew his value to be considered a top-100 prospect in baseball. After coming over to the Padres, Tatis Jr. hit .273 with four home runs and 14 stolen bases in only 176 ABs in short season Rookie Ball. He is rated the Padres 8th best prospect, and is expected to rise in the rankings this year. Tatis Jr. is 6′ 3″, 185 lbs and is only 18 years old. Being so young, he more than likely hasn’t fully developed his frame yet and is expected to have very raw power and great speed eventually. Due to his large size, he may be transitioned into a third baseman, but for now, he is my projected Padres 2020 starting shortstop. 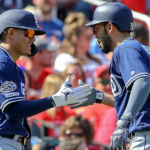 Fernando Tatis Jr. could be the one to put good riddance on the Padres’ shortstop struggles. Tatis Jr. has received special raves about his bat speed and ability to find the barrel when hitting. This could enable him to be a hitter who hits for high average and power from the right side of the plate. He also has been noted for having a cannon of an arm in the infield, which will be dominant from either shortstop or third base. 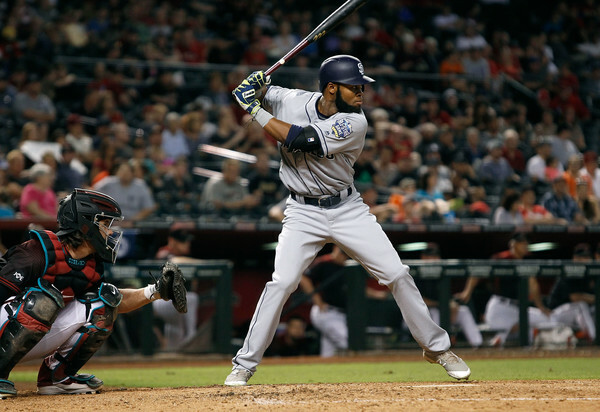 It will be fun to watch Fernando Tatis Jr. develop over the next few years, and hopefully transition into an all-star shortstop for the Padres. 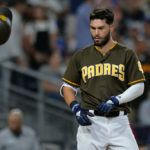 Breakdown: Hedges, like Margot and Renfroe, is the third young player who is in his first season of starting everyday on the diamond for the Padres. Hedges got off to a very slow start at the plate, starting the season without a hit in his first 25 at bats. He seems to have gotten past the slump, going 4 for his last 10 with a double and home run. Although Hedges will never be known for his bat, it’s worth noting that he raked in Triple-A last year with 21 home runs 82 RBI and a .326 average. Hedges is considered one of the best, if not the best, defensive catchers in all of baseball. The current pitching staff has already raved about his ability behind the plate. He draws the compliments with his pitch-framing skills, and ability to call a game. He also has the fastest pop-time projection in baseball to keep base runners from stealing. Hedges’ value goes way beyond his offensive stat line. When his hitting comes around consistently, he can be expected to hit in the 15-20 home run range and hit for a decent average to boot. His presence behind the dish will be invaluable in the 2020 season, with the Padres young, talented pitching staff. 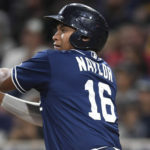 Breakdown: This was another very hard pick to make for the 2020 team because the Padres have quite a few high-potential guys in the outfield who should be MLB-ready by 2020. This also omits current starter, Travis Jankowski, who is very liked and solid on the field. I picked Ona because he has a large, muscular body and has power potential at the plate. Ona was signed by the Padres in this most recent international free agent signing period. He signed for an $8 million bonus and was considered the eighth best overall international prospect at the time. 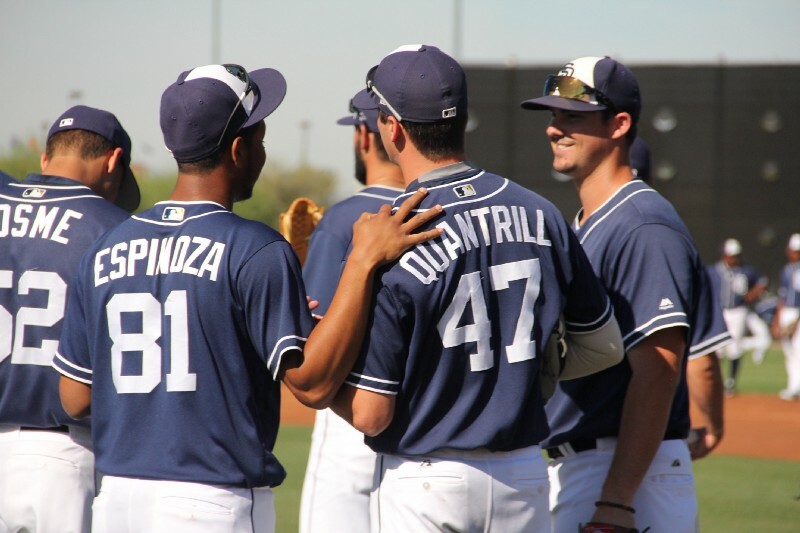 Ona was one of the more polished prospects from the class, and even made a few spring training appearances for the Padres this year. He is 20 years old, and could rise through the system very fast. Ona fits the mold for a power hitting corner outfielder in the MLB with his plus power and plus arm. For some reason he reminds me of a young Yasiel Puig. If he can continue to develop and mold into a solid MLB-caliber outfielder, he should be an exciting one to watch. His offensive presence would be felt near the bottom of the Padres’ order, and give it some pop. If Ona doesn’t pan out, the Padres have many options to fill this spot. He could project for middle-tier average with 20+ home runs and a cannon from either corner outfield position for the Padres in 2020. Breakdown: It pains me to even write that Yangervis Solarte isn’t in this lineup as either a second baseman or a third baseman. Hudson Potts has shown some promise and value at the early stages of his professional career. He was drafted by the Padres in the first round (24th overall) in the 2016 amateur draft out of a Texas high school. Potts wasn’t expected to go as early as he did because many worried he wouldn’t be able to be signed away from his Texas A&M commitment. But the Padres did it anyway, convincing him with a $1 million dollar signing bonus. 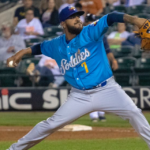 Potts has rewarded the Padres for taking him so early with his performance in Class A short season league, and even more so in Rookie Ball last year. In Rookie Ball, Potts hit for a .295 average, a home run, and eight stolen bases. Potts is a big kid, measuring 6’3 in height and 205 in weight. At only 18 years old, he still has a lot more room to grow and develop into an even bigger frame. Potts is special because of his ability to make hard contact with the ball at the plate. The Padres believe he has a chance to be a future middle of the order hitter. Potts has already proven to be more advanced than expected to start his pro career. Hats off to the Padres’ scouting for seeing the unproven in Potts. He looks to be an above average hitter with at least average power by the time he reaches the big leagues.